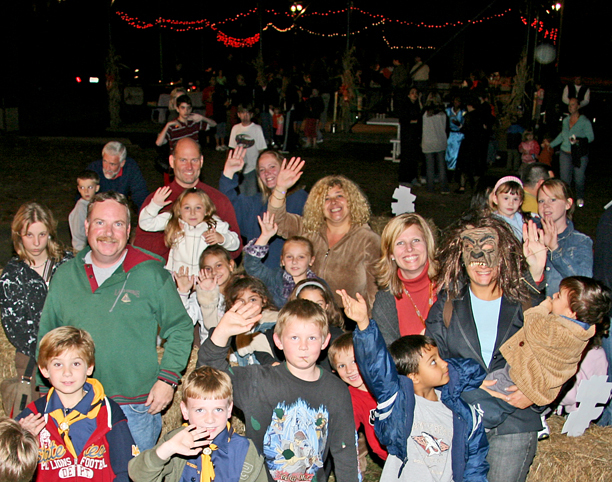 Woodland Park was invaded by ghosts, goblins, aliens and assorted scary characters on the evening of October 19, 2006. Over 600 participated in this event. Halloween in the Park began at 6:00 p.m. and concluded at 9:30 p.m. Visitors walked down the Haunted Trail to the back parking lot. Every 15 minutes, two hayride trailers took turns collecting riders for the very scary ride to be frightened by a variety of terrifying citizens of the night. After the horrific experience, they escaped at the Roosevelt Avenue end of the pavilion — where they were treated to refreshments. The pavilion fireplace was warm and glowing. Tarot card reader Linda Cross delighted participants. Heights resident, Al DeAngelo, of "Night-Mares Haunted Attractions" in Montvale (www.Night-Mares.com), "set-up" and operated fright stations. The Recreation Department Advisory Board helped out. Funtime Enterainment provided scary music. The Recreation Department sponsored the event and supplied refreshments.